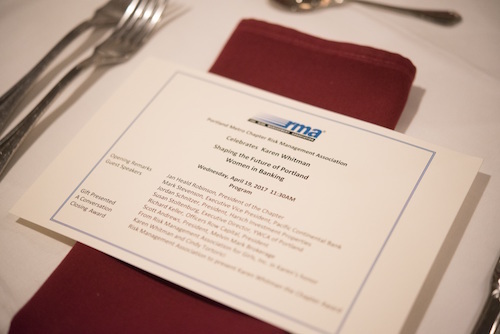 The highlights of the year for the RMA Portland Metro Chapter are the general membership luncheons. Membership luncheons provide senior banking professionals in the Northwest an opportunity to network with peers and enhance their knowledge of risk management principles. Membership luncheons include a served lunch, time for networking, and a notable speaker or panel from the local banking community to speak on current topics in banking. Membership luncheons provide a means to meet other banking and finance professionals in your community as well as hear valuable insights from speakers and leaders in the industry. Our luncheons are open to members and non-members alike to encourage the growth of our association and demonstrate some of the benefits of membership. Members receive discounted admission rates for most events put on by the RMA Portland Metro Chapter. See past membership luncheon themes and speakers in Past Events or register for our next membership luncheon on our Upcoming Events page.